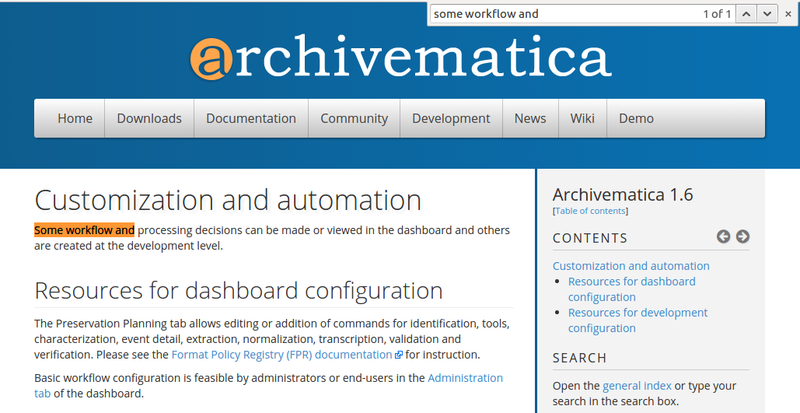 Thank you for your interest in translating Archivematica! Community translators are vital for internationalizing Archivematica for use around the world. We appreciate the efforts of all volunteer translators on the Archivematica project! We use Transifex to support the publication of translations. Transifex allows multiple users to contribute translated strings, makes the harvesting process faster and easier, and enables Artefactual to publish translations more often. There are multiple Archivematica projects to translate: the documentation, the interface, the website, and the Storage Service. Go to Transifex and log in or create an account if you don’t already have one. On the second configuration page, you will be given the option to start your own project or to join an existing one. Select Join an existing project. 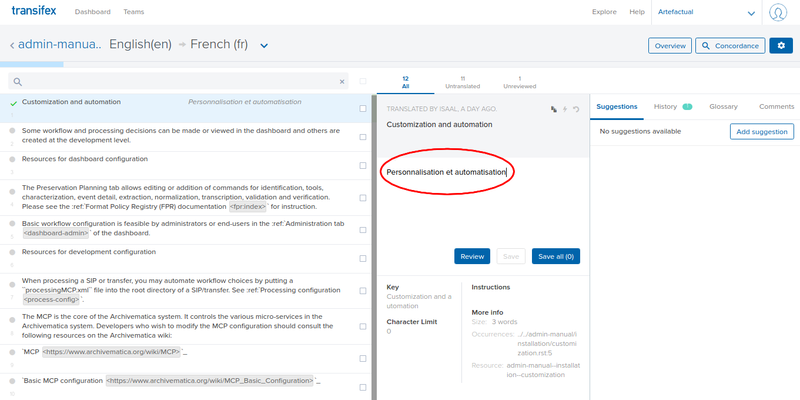 The last configuration page will ask you to identify languages that you speak. Select as many as are applicable and click on Get started. Select the project that you would like to translate - the Archivematica interface, the documentation, Storage Service, or website - and click on the blue Translate button to start translating. To translate the string, enter your translation in the middle column. Remember to click Save translations when you’re done! In the Translations Editor, look for the section called More info (you may need to click on Context, depending on how your browser is sized). Under this, there is a subsection called Occurrences. Occurrences contains the URL slug where the string occurs in the documentation. Copy the part of the slug that is located between .. and .rst. For example, if the slug is ../../admin-manual/installation/customization.rst:5, copy /admin-manual/installation/customization. Copy the slug that points to where the string comes from. Go to https://www.archivematica.org/docs/archivematica-1.6 (or whatever version of the documentation you are translating, i.e. archivematica-1.7, 1.8, etc). Append the copied slug to the above link. Using the above example, the URL would now read https://www.archivematica.org/docs/archivematica-1.6/admin-manual/installation/customization. Press enter to go to this URL. The page you are now on contains the string that you are translating. Search for the string on the page by hitting control+f (or command+f) and typing in the first few words of the string. Click on a string that has already been translated. Make your edits in the Translation Editor and click Save translation.